I tried. I really did. I even read the first two books, but I knew it was a bad sign when it took me two tries to make it through the second novel in author Veronica Roth's dystopian young adult series, Insurgent. I didn't even bother to try and read the third and final novel in the series if that tells you anything about how much I cared about what happened to these characters and their overly complicated world. If nothing else, I thought not reading the source material might make the third film (which of course is part one of a two part finale that splits the final book in half-the second of which doesn't arrive until next summer) more intriguing given I didn't know exactly where the story would be heading, but as with the two previous films while there is always stuff happening, the story doesn't necessarily move forward. This is the problem with the series as a whole never mind the individual films. There is even the idea there is too much going on as each character's dialogue is plagued by large portions consisting of pure exposition, but if we don't know what we need to know about this world by the third film there's simply too much and Allegiant suffers greatly from too much talking and not enough actually happening. The film seems a pristine example of taking two steps forward only to take three steps back. At the very least, we expect story tropes of the YA genre to be pushing the audience forward to some type of inevitable showdown between the exceptional protagonist and the jaded authority figure who doesn't believe in them, but the Divergent Series has repeated this so many times at this point that there is no tension left and worse, we can see where things are going given they've been telegraphed a handful of scenes prior. 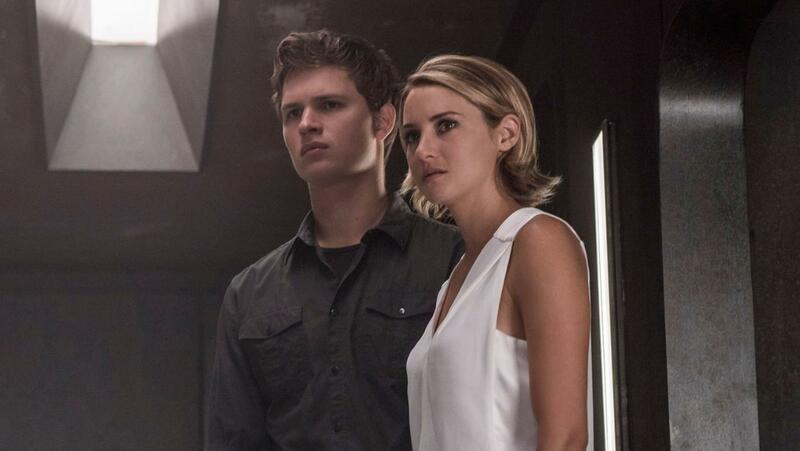 I'm sure Roth had interesting ideas she wanted to explore going into writing this franchise and some even start to peek through in certain moments here, but it seems like the filmmakers and crew are as tired of making these movies as audiences are of watching them and thus the cohesiveness of the actual story is the last thing on their minds making Allegiant go straight to the back of ours as soon as the credits begin to roll. Siblings Caleb (Ansel Elgort) and Tris Prior (Shailene Woodley) find themselves in yet another totalitarian society. 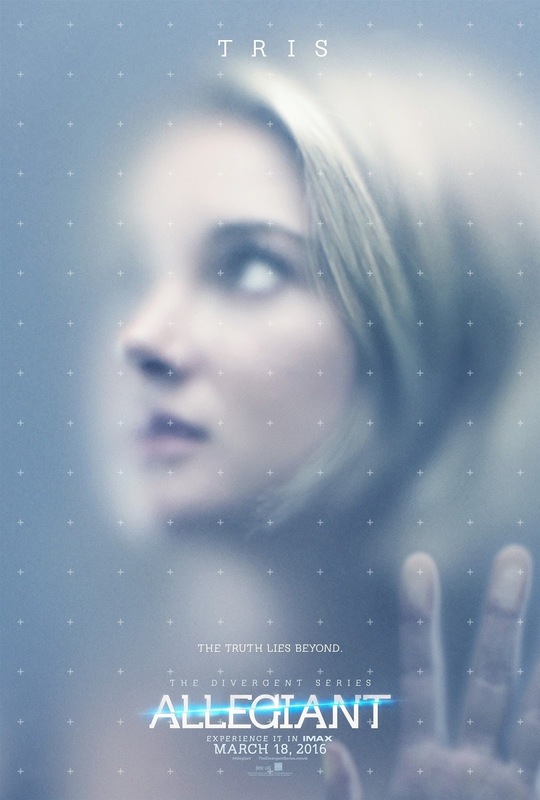 When we last left Tris (Shailene Woodley) and her love interest/bodyguard Four (Theo James) they'd dismantled the faction system (consisting of Dauntless, Amity, Erudite, Abnegation, and Candor) in the futuristic Chicago while Four's mother, Evelyn (Naomi Watts), had just taken out Erudite leader Janine (Kate Winslet). In truth, the series could have ended on some sort of satisfactory level with the second film, but of course these things have to at least be a trilogy and thus we now have the obligatory third chapter that essentially restarts the same conflict from the first film all over again with the added caveat of allowing our heroes over the sacred wall to discover yet another dysfunctional society that on the exterior seems to want to help our hero, but secretly has some diabolical plan to control every aspect of individuality. Tris and Four are on good terms, but Four continues to have issues with his factionless mother who seems to have rid the world of Janine just so she could take over the mantle. Evelyn is holding public trials for the remaining Erudite's which translates more to public executions as Octavia Spencer's Amity leader objects and forms her own group of fighters who take on the titular namesake. Meanwhile, Tris and Four along with Christina (Zoë Kravitz), Peter (Miles Teller), Tori (Maggie Q) and Tris' brother Caleb (Ansel Elgort) decide they need to get the hell out of there and thus concoct a plan to scale the wall and explore the great unknown despite Evelyn having put the city on lockdown and given her most trusted henchmen, Edgar (Jonny Weston), the responsibility of not letting anyone outside the wall. Of course, our heroes make it over in one of the more redeeming action sequences in the film, but the characters seem to make such dumb decisions and the CGI looks so cheap at times that even such action beats can't be enjoyed due to how distracting these elements are. Once our heroes do make it over the wall they are welcomed with open arms into a futuristic society that has been watching Chicago for centuries, their leader David (Jeff Daniels) explaining how the city was an experiment to see if they could undo the unfortunate effects of man once again trying to play God in the past. As you might guess, while David and his shiny chrome world might at first seem pleasant and inviting they are not all they appear to be. What is more confusing than anything about this series is how it has managed to attract such strong talent and yet has nothing to offer them in return. Forget the fact that the first two installments featured Winslet who more or less makes her home in Academy Award nominated films, but furthermore this third installment replaces her with a credible and well-respected talent like Daniels, not to mention the likes of Watts and Spencer still wandering around in the supporting cast. Even the likes of Teller and Woodley are too good for this type of material and have long since outgrown it while it seems James is becoming all the more anxious the closer this series comes to its conclusion. Kravitz feels like a franchise mainstay at this point having also popped up in an X-Men movie and Mad Max with her dad's role in the Hunger Games franchise only making the actual distance between these two franchises that much further. Elgort actually gets the worst of it though, as he is tasked with reacting to nothing a lot of the time and trying to sell it as if his high-minded Caleb is truly astonished by the futuristic technology. Most of the time, the guy comes off like a doofus which is difficult given he was completely charming and authentic opposite Woodley in The Fault in our Stars. Despite James having little to no career outside of this franchise his presence here is undeniable and kind of the only thing that keeps the silliness in check. His brooding, hulking manner hardly stands to elicit any sympathy, but that's largely due to the fact we know Four is going to get things done. His relationship with Woodley's Tris somehow feels natural at this point and Woodley is still doing all she can to make this franchise work. At a time when it might be easier to take a few steps back and re-evaluate how she's playing this part its clear Woodley still cares about Tris' plight and her attempts to save her world without becoming just another talking head. On the other end of the spectrum is Teller who has openly stated how he only took a role in this franchise for business reasons and as a result he no longer seems to care. Strangely enough, this lack of trying has allowed Teller's Peter to be a lot more fun as he provides some of the only genuine moments in the movie period. Four (Theo James) is reunited with Tris after being separated by the powers that be. To put it briefly, Allegiant is pure nonsense. This franchise, under the direction of Robert Schwentke (RED, R.I.P.D.) for the previous installment as well as this one, looks for redeeming qualities not in its story beats or character traits (despite Teller having fun it's painfully obvious how little of an arc Peter has throughout the franchise), but rather in the action scenes and the production design of this futuristic world, but as I said earlier it all looks so cheap and feels so amateurish that it's impossible to take seriously. It's a shame, really, because Schwentke has displayed in past projects that he has a flair for visual storytelling and the ability to make mindless action and spectacle entertaining if nothing else, but even those skills can't transcend a series that has so buried itself in complex world building and unnecessary plot twists that it would be difficult for anyone to find a way to crawl out of such a deep hole. Lee Toland Krieger, who made last years underrated Age of Adaline, is already in pre-production on the final film in the series, Ascendant, so maybe this fresh perspective will bring new light and possibly even hope that The Divergent Series could go out on a high note, but I'm not holding my breath. Part of me even wants to try and read Roth's final book in the series just to see if it is indeed as bad as Allegiant has made it seem or if there have been significant changes. As this first part of the two part finale came to a close my mind was boggled as to how they were going to come up with enough material, enough action even for these characters to participate in that might fill another two hours, but then I remembered there was a third Hobbit movie and it all made sense. During one of the many (surprisingly brutal) action scenes in the film my friend turned to me and said, "In the future, there is no blood." It's true as far as Allegiant is concerned, but more for than the sake of a PG-13 rating it just feels lazy. Of course, this is just a minor complaint in the bigger picture of all that is wrong with Allegiant, but it is small details such as this or how a plot device about surveillance is set up so obviously that it's clearly just for the sake of allowing the story to get away with things much easier than it should. Everything about the film feels easy though, and while that may seem attractive on the surface everyone knows that's not what anyone really wants, not if they are looking for something to leave a lasting impression.